Determination of effective radium content and uranium concentrations for the soap and the detergent powder samples in Iraq. Department of Physics, Faculty of Science, University of Kufa, Najaf, Iraq. 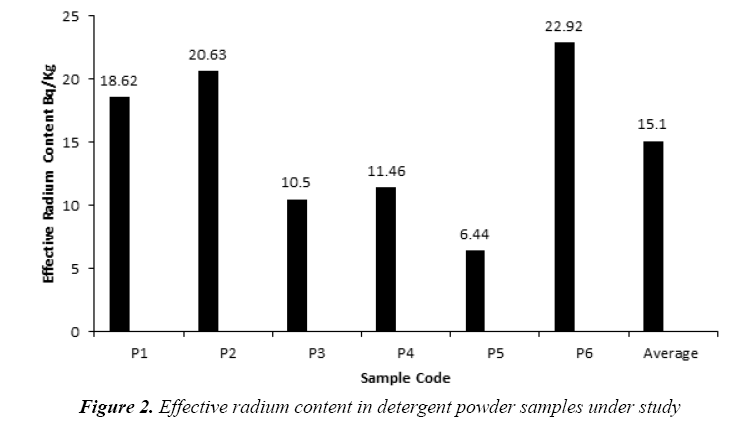 Effective radium content and Uranium concentrations in some types of dry cleaning materials samples such as soap and detergent powder from different sources were collected from the Iraqi markets in this study. A sealed container technique was used depending on the LR-115 Type II SSNTDs. The results demonstrated that the effective radium content in the soap ranged from (3.82) Bq/Kg to (39.54) Bq/Kg with an average (13.22 ± 4.70) Bq/ kg, while the effective radium contend in detergent powder and ranged from (6.44) Bq/Kg to (22.92) Bq/Kg with an average of (15.10 ± 2.92) Bq/kg. The Uranium concentrations of the soap and powder detergents ranged from (0.21) ppm to (2.52) ppm with a mean (0.79 ± 0.30) ppm and from (0.32) ppm to (1.42) ppm with a mean (0.86 ± 0.19) ppm respectively. Furthermore, the current results demonstrated that there is a strong correlation (r=0.92) between effective radium content and uranium concentrations. The effective radium content and uranium concentrations in the studied samples were lower than the maximum values recommended by international bodies. Effective radium content, Uranium concentrations, cleaning materials and LR-115 detector. Soaps and detergents can be defined as cleaning agents that have the ability to react with water to remove the foreign particle from solid surfaces . Soaps were made from many different sources such as; oils, animal fats, and plants, while detergents from was from oils (hydrocarbon compounds of petroleum or coal). From a chemistry viewpoint, soaps are salts of sodium or potassium with high fatty acids like stearic, palmitic and oleic acids which can either be saturated or not. They include a long chain of hydrocarbon with around 10-20 carbon and one carboxylic acid functional group . Naturally, all minerals and raw substances include radionuclides. From radiation protection perspective, the focus directed toward the radionuclides presented in the 238U and 232Th decay series. Most activities of human that involve minerals and raw substances, the levels of exposure to these radionuclides are not markedly greater than that of background levels and are not of high concern to radiation protection . However, certain human activities may be results in an increase in the exposures and need to be controlled by regulations. In this context, materials that are giving rise to the increased radiation exposures are well known by the Naturally Occurring Radioactive Material (NORM). NORM is an acronym for the Naturally Occurring Radioactive Material, which includes all radioactive elements, existed in the environment. Long-lived radioactive elements include uranium, thorium and potassium and any of their decay products, such as radium and radon [4-6]. These elements have been existed in the Earth's crust, atmosphere and specifically concentrated at certain places such as uranium ore bodies. Radium and uranium may be taken up by different cleaning materials such as soap and powder detergent, which usually used by people beings, Therefore it was decided to estimate the radium and uranium content in the samples that collected from the local market. Pediatric age groups such as Infants and children are the population most in danger for adverse health effects from recurrent exposure to 226Ra and 238U in soap and detergent powder. Due to their weight and developing systems, infants and children are exposed to higher doses. Their growing bodies absorb additional contamination and might sustain permanent injury if exposures occur throughout crucial growth stages. Therefore, pregnant and nursing women, women WHO could become pregnant, infants and tiny children are sensitive populations that ought to avoid intense giant quantities for an extended amount of your time. The calculable health risks from exposure to low levels of 226Ra and 238U are little, and short term exposures cause solely very little risks. See your health care supplier concerning your specific health issues. The radioactivity measurements in the cleaning materials have been studied by very few researchers. To illustrate, in 2002 Hana , studied Radium-226, Uranium-238 concentrations and Radon-222 in certain samples of teeth paste which are available in the Iraqi local markets using CR-39 plastic nuclear track detector. In this research, it was found that the ranges of each of Radon-222, Radium-226 and uranium-238 concentrations were (0.094-0.429 Bq/kg), (0.103- 0.471 Bq/ Kg) and (7.5-34.5 ppb) respectively. In 2014, Abojassim et al , investigated the radon concentrations in various teeth pastes samples which are available in Iraqi markets, using CR-39 plastic nuclear track detectors when it was found that the concentrations radon, radium and uranium (in ten samples) were ranged from 6.03 ± 0.70 to 101.08 ± 7.44 Bq/m, 0.08 ± 0.009 to 1.416 ± 0.104 Bq/Kg and 2.962 ± 0.345 to 49.620 ± 3.653 PPb respectively. The aim of this study is to estimate the radium and uranium levels at different types of soaps and powder detergents which used are available in Iraqi markets using LR-115 Type II. Fourteen types of cleaning materials (domestic and foreign) were collected from Iraqi market of Iraq, as shown in Table 1. Where, ρ=Average of total track density for a sample (track/cm2) and α=Area of field view. Where, where m refers to a mass of sample (kg), A refers to an area of a cross section of the cylindrical can (m2) and h refers to the distance between the detector and the top of the sample (m). ρ represents the counted track density, k is representing the calibration factor of the LR-115 Type II track detector and T represents the effective exposure time. The present study based on the investigation of the 14 samples of different kinds of soap and detergent powder in the local Iraqi markets made at different countries. The calibration factor (0.02 track/cm2.d per (Bq/m3) was adopted from . Tables 2 and 3 present the effective radium content for soap and detergent powder samples under study in different countries. 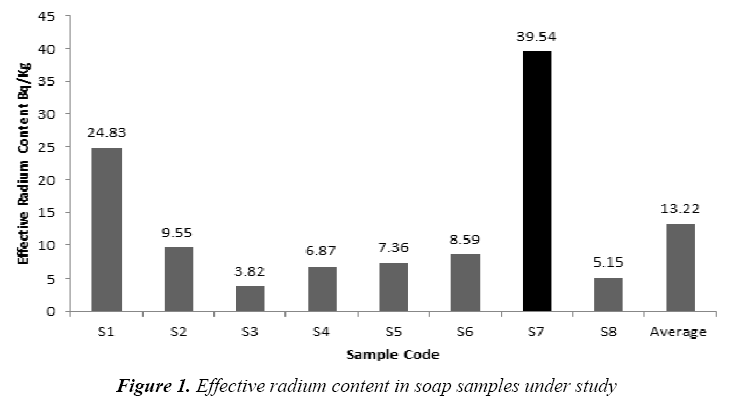 The highest average of the effective radium content concentration in soap (39.54 Bq/kg) found in (S7) sample (Clonex), whereas the lowest average concentrations (3.82 Bq/kg) found in (S3) sample (Duru) as shown in Figure 1, while the highest average of the effective radium content concentration in detergent powder (22.92 Bq/kg) found in (P6) sample (Fine), whereas the lowest average concentrations (6.44 Bq/kg) found in (P5) sample (Altunsa) as demonstrated in Figure 2. The resulted data demonstrate that the effective radium content in all samples was below the allowed limit published by the OECD . The uranium concentrations in the collected soap and detergent powder samples are given in Tables 4 and 5, respectively. 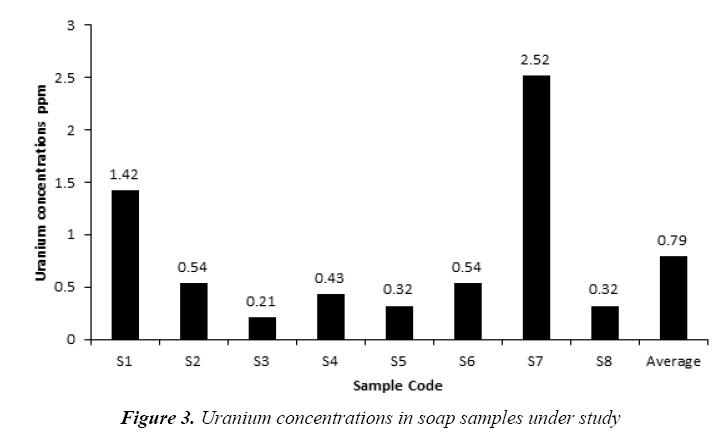 The uranium concentrations in soap varied from 0.21 ppm to 2.52 ppm with an average 0.79 ± 0.30 ppm as shown in Figure 3. 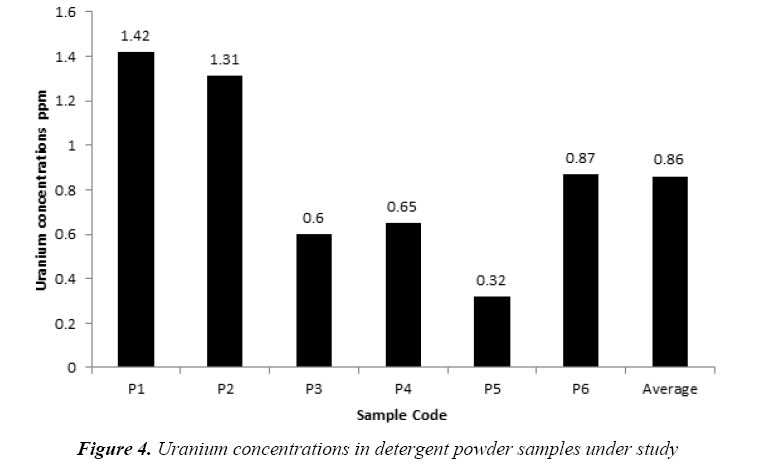 But, the uranium concentrations in detergent powder varied from 0.32 ppm to 1.42 ppm with an average 0.86 ± 0.19 ppm as shown in Figure 4. The uranium content in soap and detergent powder samples were low in compares with safe limit determined by UNSCEAR . All results obtained in soap and detergent powder samples for effective radium content and uranium concentrations were less than the allowed limits by OECD and UNSCEAR. I would like to knowledge all those contributed in declaring this issue. Special thanks to the staff of the department of physics at Kufa University. Whitten DO, Whitten BE. Handbook of American Business History: Extractives, manufacturing and services. Greenwood Publishing Group. 1997. 221. Smulders E, Rybinski W, Sung E, et al. Laundry Detergents. Ullmann’s Encyclopedia of Industrial Chemistry. 2007. Merrill E, Gressel T. Environmental Radio activity. 4th ed. Academic Press, USA. 1997. Garnier Laplace J, Colle C, Morello M. Uranium Naturel et Environment, IRSN, 2001: 2-6. Henner P, Garcia-Sanchez L. Thorium 232 et Environnement, IRSN. 2002: 2-7. Hana NA. Determination of uranium in teeth paste by using CR-39 detector. Thesis. M.Sc. College of Science, The University of Mosul. 2002. AboJassim AA, Shaymaa AK. Radon of concentrations measurement in some types of toothpastes available in the Iraqi markets. Journal of Babylon University/Pure and Applied Sciences 2014; 22: 1967-1972. Myrick T, Berven B, Haywood F. Determination of concentrations of selected radio nuclides in surface soil in the US. Health Phys 1983; 45: 631-642. Hady HN, Abojassim AA, Mohammed ZB. Study of Radon levels in fruits samples using LR-115 Type II detector. J Environ Sci Technol 2016; 9: 446-451. Mahur AK, Khan MS, Naqvi AH, et al. Measurement of effective radium content of sand samples collected from Chhatrapur beach, Orissa, India using track etch technique. Radiat Meas 2008; 43: S520–S522. Khan MS, Zubair M, Verma D, et al. The study of indoor radon in the urban dwellings using plastic track detectors. Environ Earth Sci 2011; 63: 279-282. Islam GS, Abdullah MNA. Determination of trace concentration of uranium in soils by the nuclear track technique. The Abdus Salam International Centre for Theoretical Physics 1998; 29-40. Baykara O, Kulahci F, Do?ru M. Measurement of uranium concentration in soil samples by two different methods. J Radioanal Nucl Chem 2007; 272: 195-197. Biersack JP, Ziegler JF. IBM Research. TRIM, Version 98. 1998. Al-Hamidawi AAA, Husain AA. Radiation hazards due to radon concentrations in dwellings of Kufa Technical Institute, 'Iraq'. Phys Int 2016; 7: 28-34. OECD. Exposure to radiation from natural radioactivity in building materials. Organization for economic cooperation and development. Report by a group of experts of the OECD Nuclear Energy Agency, OECD, Paris. France. 1979.